This is an Extra Detail Magnification (or "EDM", for short) of the Western portion of yesterday's - litterally - ethereal (and extremely suggestive) scene, captured by the NASA - New Horizons Spacecraft, tells us yet another (actually, a new) story of Pluto's diversity of the Geological and Compositional Surface Features located on its the North Polar Regions. Long Canyons run vertically across the Polar Area - such as part of the - so far - informally named Lowell Regio (after the Astronomer Percival Lowell, who founded the Lowell Observatory and initiated the search that led, in the end, to Pluto's discovery). The widest of the visible Canyons is about 45 miles (such as approx. 72,4203 Km) wide and runs close to the North Pole. Roughly parallel Subsidiary Canyons - visible in this scene - are approximately 6 miles (i.e. about 9,65604 Km) wide. 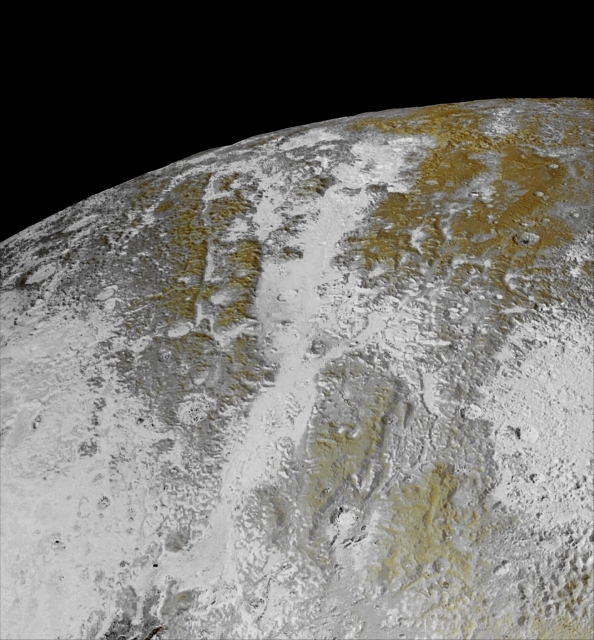 The (highly) degraded Walls of these Canyons appear to be much older than the more sharply defined Canyon Systems which have been already found elsewhere on Pluto, perhaps because the Polar Canyons are older and made out of weaker Material. These Polar Canyons also appear to represent some kind of evidence (but we cannot be sure of such a circumstance) for an ancient (REALLY ancient!) period characterized by powerful Tectonic Activities.